This guide is long over-due but I suppose better late than never. Over the past year, my MPCNC has been a gateway machine that got me introduced into the CNC world. I started off with a 3D printing setup, but always wanted to do some metal work. 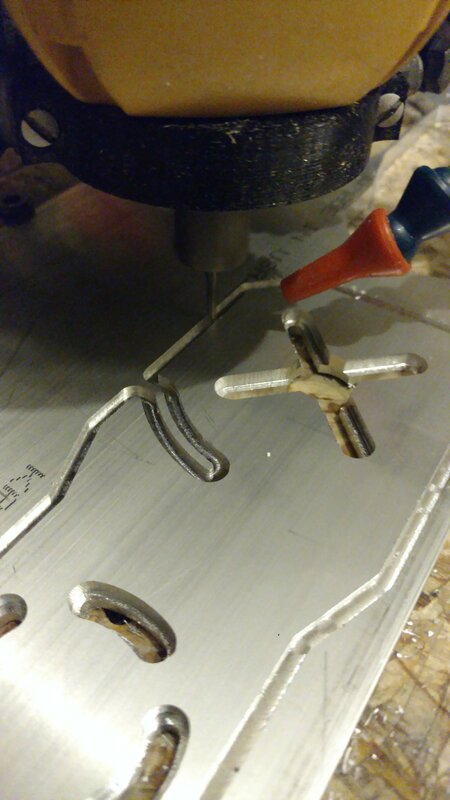 I now use my MPCNC to cut out custom electric skateboard motor mount conversion kits out of aluminum. I guess you could say I have a good amount of experience when it comes to this topic. I run my machine hours a day and know what works and what doesn’t. All results may vary, but I hope to cover important topics that will get you into the fun of aluminum milling on your MPCNC. Almost all the tips apply to milling other materials as well. 5. CLIMB MILL, don’t ever cut conventional! Our timing belts don’t have considerable backlash, use that to your advantage. 7. Don’t cut too slow. Keep the cutter moving. 8. Put your endmill as far into the collet as possible. Shorter tools are harder to break! 9. Check your spindle for perpendicularity. It cuts down chatter. Picture of the overall setup. As you can see, my build size is very small and short along the z axis. I went a step further by stacking particle board on the work area to bring the piece closer to the gantry. More rigidity is king!! What size your machine is has a direct impact on what results to expect. It is by far the most important thing to consider machine side. A smaller machine is more rigid given all variables are kept the same. In particular, you want your Z axis to be as short as possible. I cannot stress enough how big of an impact this makes. Every inch counts. The closer your bit is cutting to your center gantry, the faster you can push the machine. 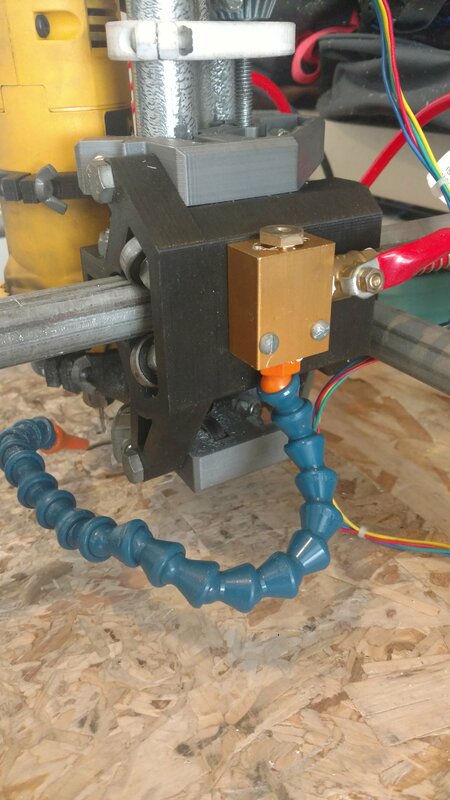 My build has an overall dimension of 2′ x 3′, with my Z axis travel being 2 inches. This can be a hard pill to swallow for some because you may want to use your MPCNC for projects that require a longer Z axis or bigger build volume. If you want best results, modify your machine size. Ryan’s design is made to be resized. There are other ways to improve rigidity besides the build size. For starters you want the material as close to the center gantry as possible. 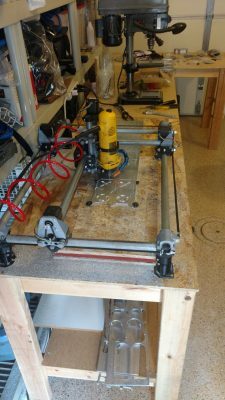 You can achieve this by raising your work area up to let the material be cut closer to the gantry. You also want to avoid the obvious mistakes, like a vacuum fastened to the gantry in a way that could tug awkwardly, or have any loose bearings that give the machine some play. It is also important to make sure the base is securely fastened to the table. You shouldn’t be able to move around the outer frame at all. A good test I used to do was activate the steppers and try to wiggle the bit around, seeing where the most “give” was and start from there. I have gotten a few questions like if I made modifications to the frame. I don’t believe it is necessary if you know how to set it up properly. Your CAM and machine size dominate the cut. For CAM, I personally use ESTLcam but I have tried Fusion360 with outstanding results. For beginners in milling, ESTLcam is what I would recommend due to its simplicity. If you are an Autodesk guy like I am, giving Fusion’s CAM a try is great also. CAM is where you will do your fine tuning for your cuts. You can only build the MPCNC so good before you will reach physical limitations. The real magic happens in how you engage those cuts. There are many many ways to do one cut, but some are vastly smarter than others. The answer is not so simple as, “What numbers do I plug in?”. Seeing as everyone’s machine is a little different, I cannot give out such magic “cheat codes” that will guarantee a successful cut. What works for you is a matter of experimentation. 1. Cut “fast” but not deep. Have a feed rate that you know will be giving you nice chips. Once you have that feedrate you’re happy with, vary the depth of cut (DOC). If you want help on finding out what speeds and feeds to use, I found GWizard to be quite useful. 2. For pockets. Use adaptive clearing/trochoidal tool paths. Estlcam has what is called trochoidal milling. This video best explains it. Fusion 360 has what’s called adaptive clearing. 3. Do a finish pass. When I did my first cuts I could not figure out why my parts were always poor tolerance and looked messy. I realized I was lacking the light finishing pass. Do the finish pass as light as you can get it. You want it to take off BARELY any material, or else deflection will ruin your tolerances. The finishing pass can be full DOC of the material you’re cutting. If you do it in steps, the finish will not be as even. I found out a very neat trick when it comes to getting within near perfect tolerances. In estlcam, I set my finish tool to a LOWER diameter than the actual tool so when it comes around, it actually theoretically undercuts the dimensions. I do this to combat the natural deflection we see so that way my tolerances come out perfect every time. Even when I cut material that is 3/8″ thick, I can get within +-.1mm. I only lower the diameter by a little, for example for a 1/8″ cutter, I set my finish tool diameter to 2.95mm instead of 3.175. You will have to experiment what works for you. If you are cutting very thin material, this is totally unnecessary. The biggest mistake I find people do is use an improper cutting tool. No matter how good your CAM is or how great your machine is made, a tool that is not designed for the the job will result in frustration and wasted money/time. For 90% of people that will read this, what you will want to go for is a 1/8″ carbide end mill with 1 or 2 flutes. Single flute is my vote as it is the most forgiving of them all. My reasoning for this is that if you’re using a high RPM router like the DW660, any more flutes than 2 will simply clog and not cut well. I go more into this on my chip clearing section. I only use Kyocera single flute bits. Ryan does sell them. I am sure there are many great options out there, but your main focus should be 1/8″ carbide single flute cutters. Don’t even try 1/4″ for obvious reasons…Smaller end mills work good too but they can be easier to break and clog. Avoid downcut end mills as they will pack the chips back into the cut, the exact opposite of what you want. No coatings are necessary for the kind of work we do. We have all seen those horror videos of those aluminum cuts that go horribly wrong in that the cut starts off good, but overtime things begin to break down. The end mill will break, you will hear your spindle bog down, and the cut quality will die. These are common results when your end mill gets clogged. Aluminum is rather soft and gummy, even in hardened versions. When things heat up too quick, the aluminum fuses to the tool and the cutter is ruined for good. The more flutes your tool has, the easier it is to clog. This is why single flutes work so good. Your goal should be for the cutter to slice a clean chip, then evacuate it out of the cutting area immediately. The best way to do this is to run high pressure air targeted at the cutter to blow the chips out of the way. If you are planning to do lots of aluminum cuts or already have an air compressor, this is the best option. I used a Husky 4gal air compressor I got at Home Depot, and this cheap coolant system. I took off all the coolant stuff and sealed the block. I then ran a Locline branded nozzle because the ebay one kept leaking air so I was losing pressure. Knowing that you will rarely, if ever, have to worry about chips getting in the way is a huge relief. I don’t know about you, but I would rather watch my machine in awe or do something else than stalk it with a vacuum the entire time. The whole self reliance feeling is great and it makes it look much more professional. It creates quite a mess but at least that mess isn’t in the cutters way. 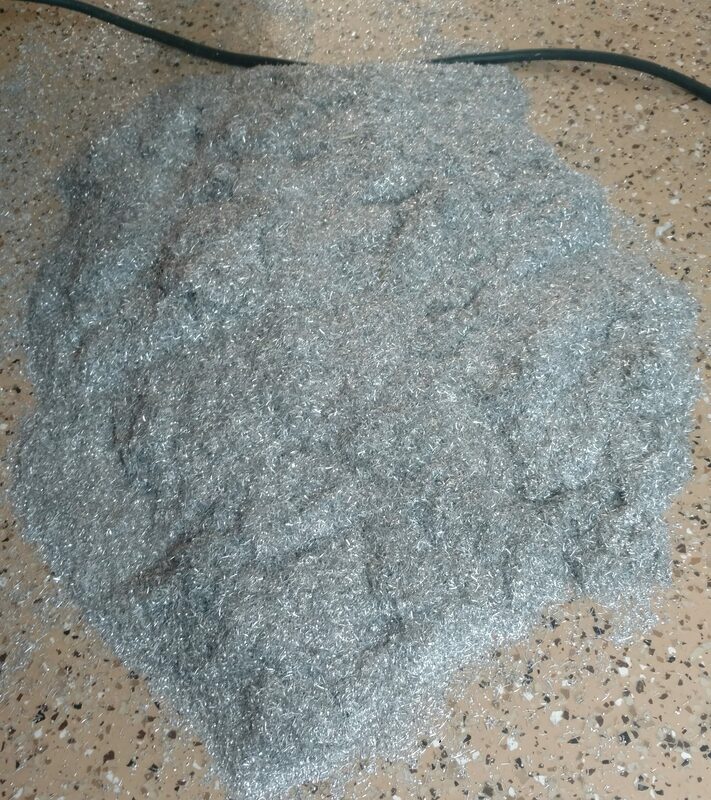 If you’re doing it right, you will begin to notice balls of aluminum fuzz building. Careful, it does not like being pet! Welp, I think I covered just about everything I wanted to. If anyone has any questions, feel free to PM me on the forums.